It’s been an amazing year in cloud computing in general and in OpenNebula in particular. We are excited to keep the momentum going. The number of downloads, users, and contributors has continued doubling each year and we have been able to offer more than we ever thought possible. Moreover, 2013 was a landmark year for our project with the celebration of the first ever OpenNebula conference. With 2013 coming quickly to a close, we’d like to review what this year has meant for the OpenNebula project and give you a peek at what you can expect from us in 2014. You have all the details about the great progress that we have seen for the OpenNebula project in our monthly newsletters. During 2013, we have worked very hard to continue delivering the most solid, powerful and flexible open-source management platform to build and manage Enterprise Clouds. We have continued focusing on solving real user needs in innovative ways with the involvement of the users in a really vendor-agnostic project. Our project has released 3 updates of the software: 4.0 Eagle, 4.2 Flame and 4.4 Retina, and 5 maintenance releases within a rapid release cycle aimed at accelerating the transfer of innovation to the market. The roadmap of these releases was completely driven by users needs with features that meet real demands, and not features that resulted from an agreement between IT vendors planning to create their own proprietary cloud solution. A significant number of cool new features were included in OpenNebula: a highly-scalable monitoring system, an enhanced EC2/EBS implementation, an extended cloud bursting functionality, storage load balancing, multiple group support, multiple system datastore support, high availability, a revamped Sunstone with a new cloud view, multi-VM application management with auto-scaling, a whole new set of operations for VMs like system and disk snapshoting and dynamic capacity re-sizing, programmable VM actions, IPv6… There are some new drivers also, like Ceph, as well as many improvements for VMware, KVM and Xen. After the Christmas break, we will organize a IRC meeting to discuss the requests for new features and for extending existing features. This valuable input will be used to create the short-term roadmap for OpenNebula 4.6 (due in March 2014). The mechanisms offered to try out OpenNebula have been extended. Besides the existing Sandboxes with OpenNebula preinstalled (for VirtualBox, KVM, VMware ESX and Amazon EC2), an effort was carried out to develop simple how-to guides describing the step-by-step process to deploy OpenNebula in the most common linux and hypervisor combinations. Currently there are guides for CentOS/Xen, CentOS/VMware, CentOS/KVM and Ubuntu/KVM. In order to ease the installation of OpenNebula, we have also created package repositories for CentOS, Ubuntu, Debian and openSUSE to make the installation and upgrade even easier. Moreover, the documentation system has been changed from DokuWiki to Sphinx, and it is now backed in Github. This allows to improve readability, create better PDF guides, and improve collaboration. We know that the documentation is as important as the code, so we want the community to be involved, guaranteeing its high quality. We prepared two articles to briefly describe our view and experience about the different types of cloud models, how the main open-source cloud management platforms (namely Eucalyptus, CloudStack, OpenStack and OpenNebula) are targeting their needs, and the different perspectives of openness. We also had an invited post comparing the simplicity of OpenNebula with that of the Russian Soyuz. We completely agree, it is important to stay in focus to deliver a quality product. Way to go! We welcomed new partners like NetWays, Inovex, LMD, viApps and Terradue, who are providing value-added integration and consulting services around OpenNebula. These new partnerships underpin the confidence of these companies have in OpenNebula and C12G Labs. Last, and not least, the new OpenNebula add-ons program was born as well this last november. Not being mature enough to be included in OpenNebula, these new add-ons would now have support for their enhancement and coordinated development to avoid redundant work. This initiative has been well received by the community, we are glad you liked it, we are looking forward for your contributions. Awesome speakers render awesome talks, like the ones held at the OpenNebulaConf 2013. If you want to remember the great ambience of the conference, or if you haven’t got a chance to attend, here is your opportunity to (re)visit the knowledge shared in the conference in the form of recordings of the keynotes and talks. Also, you can check out the presentations of the speakers if you want to consult a particular detail that you do not quite remember. And, to make the experience even more immersive, scout through the conference pictures. Next year’s OpenNebula Conference will be held in Berlin as well, 2-4 of December, 2014. If you want to repeat or find out how it is for yourself, save the date!. Last month C12G hosted the CentOS Dojo in its HQ in Madrid. It started with a OpenNebula tutorial, given the previous day, and it displayed an array of very interesting talks, covering technical aspects related to OpenNebula and CentOS. Thanks a lot to the attendees to help render such a productive event! During 2013, a series of public training courses on OpenNebula Fundamentals, aimed to cloud administrators and operators, was given by members of the OpenNebula Team in the C12G headquarters in Madrid. The courses covered the process of installing, configuring and operating private and hybrid clouds using OpenNebula. Additionally the programs briefly addressed the integration of OpenNebula with other components in the data center. If you are interested in future public training courses, please check the C12G training web page. Looking back, it is inspiring the distance that we have come together since our first release of OpenNebula six years ago. And that is nothing compared to what is planned for the future. We are looking forward to another year of great running memories. Reached this point, we want to give a huge THANKS! to our community. No, seriously guys, you rock big time. OpenNebula wouldn’t be nearly as good as it is today without all of you. We’d also like to take this opportunity to wish you health, happiness and prosperity in 2014 to you and your loved ones!. On behalf of the OpenNebula Project. Christmas is just around the corner, and we wanted to wish you happy holidays, as well as let you know about the main news from the last month regarding the OpenNebula project, including what you can expect in the coming months. This last month was OpenNebula’s 6th anniversary. It’s good to know that after the long way, your favourite cloud platform has evolved and turn into a mature and proven solution. After two beta versions and one release candidate, where OpenNebula underwent all the tests defined in the release process, OpenNebula 4.4 Retina was released. A significant number of cool new features were included in the end in OpenNebula 4.4. Retina. Probably the feature with the biggest impact on OpenNebula scalability is the new monitoring driver, which changes the traditional polling mechanism for a pushing one. This enables OpenNebula to monitor 25,000 VMs every two minutes! Check out more details here. Another area that underwent significant improvements in the cloud bursting model, which in OpenNebula is tied to transparency to both end users and cloud administrators to use and maintain the cloud bursting functionality. Cloud bursting drivers have been vastly improved, the underlying technology being shifted from using Amazon API Toos to the new AWS SDK for Ruby. Functionality is also richer i, with support to define EBS optimized VMs, to define VM tagging, etc. Read more here. 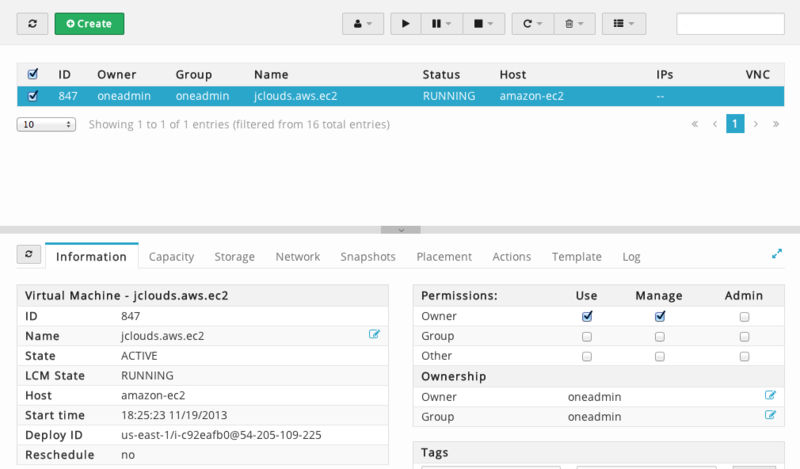 The EC2 interface offered by OpenNebula to deploy public clouds has also been enhanced in OpenNebula 4.4 Retina. For instance, instance types are based on OpenNebula templates instead of files, EBS support has been extended, etc. More details in the blog. Probably one of the most interesting feature for cloud administrators present in OpenNebula Retina is the ability to use multiple system datastores with storage load balancing. This allows to add a second backend to start deploying new VMs when the system datastore is running out of space. Details in this post. And last, but not least, the multiple groups functionality is also present in OpenNebula 4.4 Retina, with the introduction of secondary groups. These work in similar way to unix groups: users have a primary group and optionally several secondary groups. The team is now working to define the roadmap for OpenNebula 4.6. Stay tuned for new features! An amazing contribution by Deutsch Post in the form of an opennebula puppet module was published also last month in Github. This module allows to install and manage your OpenNebula cloud using the puppet platform. We want to highlight the excellent contribution made by Terradue, in the form of an OpenNebula add-on. The jclouds4one driver implements new capacities for hybrid Cloud Computing, expanding OpenNebula’s support for Cloud Bursting, with the ability to work with a variety of up to 30 cloud providers & cloud software stacks, including Amazon, Azure, GoGrid, Ninefold, OpenStack, Rackspace, and vCloud. More information on this post created in our blog by the Terradue folks. Moreover, the documentation system has been changed from DokuWiki to Sphinx, and it is now backed in Github. This allows to improve readability, create better PDF guides, and improve collaboration (via fork & pull request). We know that the documentation is as important as the code, so we want the community to be involved, guaranteeing its high quality. Awesome speakers render awesome talks, like the ones held at the OpenNebulaConf 2013 last September in Berlin. If you want to remember the great ambience of the conference, or if you haven’t got a chance to attend, here is your opportunity to (re)visit the knowledge shared in the conference in the form of recordings of the keynotes and talks. Also, you can check out the presentations of the speakers if you want to consult a particular detail that you do not quite remember. And, to make the experience even more immersive, scout through the conference pictures. Last month C12G hosted the CentOS Dojo in its HQ in Madrid. It started with a OpenNebula tutorial given the previous day, and it displayed an array of very interesting talks, covering technical aspects related to OpenNebula and CentOS. Thanks a lot to the attendees to help render such a productive event! Next year’s OpenNebula Conference will be held in Berlin as well, 2-4 of December, 2014. If you want to repeat or find out how it is for yourself, save the date! This last month, a series of public training courses on OpenNebula Fundamentals, aimed to cloud administrators and operators, was given by members of the OpenNebula Team in the C12G headquarters in Madrid. The courses covered the process of installing, configuring and operating private, public and hybrid clouds using OpenNebula. Additionally the programs briefly addressed the integration of OpenNebula with other components in the data center. If you are interested in future public training courses, please check the C12G training web page. We are very happy to announce that the OpenNebula project documentation has been totally renewed. We are now using Sphinx and GitHub to manage the documentation. On Nov 15th, 2013 Terradue announced the new jclouds4one OpenNebula add-on. Co-funded by the European Space Agency, it is released in the frame of Terradue’s “OpenNebula Add-ons” campaign. This jclouds4one driver implements new capacities for hybrid Cloud Computing, expanding OpenNebula’s support for Cloud Bursting, with the ability to work with a variety of up to 30 cloud providers & cloud software stacks, including Amazon, Azure, GoGrid, Ninefold, OpenStack, Rackspace, and vCloud. The driver requires a command line interface, built on top of jclouds, like the jclouds-cli available on GitHub (https://github.com/jclouds/jclouds-cli). The driver interacts from one side with the OpenNebula Core, and from the other side with the jclouds CLI, that behaves as an interface upon a series of Cloud Providers. The CONTEXT keyword triggers the creation of a contextualization tar file, that enables a remote contextualization (i.e. the contextualization is made available on the main Cloud Controller and served via an HTTP server like Apache). 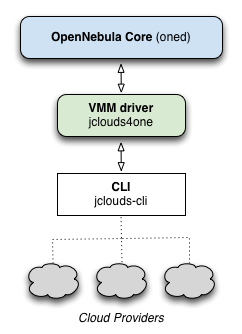 The following figure shows the jclouds4one driver in action, using the AWS EC2 provider through the jclouds library. The deployment ID gives information about the instance identifier and the public address assigned. Other information such as the private address are available under the tab Template. OpenNebula 4.4 Retina is Out! The OpenNebula team is pleased to approach winter with the immediate availability of the final version of OpenNebula 4.4, codename Retina. As a project driven by user needs, this release includes important features that meet real demands from production environments, with a focus on optimization of storage, monitoring, cloud bursting, and public cloud interfaces. OpenNebula Retina includes support for multiple system datastores, which enables a much more efficient usage of the storage resources for running Virtual Machines. This feature ships with different scheduling policies for storage load balancing, intended to instruct OpenNebula to spread the running Virtual Machines across different storage mediums to optimize their use. This translates in the ability to define more than one disk (or other backend) to hold running VMs in a particular cluster. Monitoring subsystem in OpenNebula underwent a major redesign as well, effectively switching from a pulling mechanism to a pushing model, with the implications in scalability improvements. An important effort has been made in the hybrid cloud model (cloud bursting). Using the AWS API tools have been deprecated in favor of the new Ruby SDK released, which allows the support of new AWS mechanisms like for instance IAM. Also, now is possible to fully support hybrid VM templates. Moreover, the AWS public cloud interface implemented by OpenNebula has been revisited and extended to support new functionality, as well as improved so the instance types are offered to the end user from OpenNebula templates. This is a stable release and so a recommended update that incorporates several bug fixes since 4.4 RC. We’ve done our best to keep compatibility with OpenNebula 4.2, so any application developed for previous versions should work without effort. In any case, be sure to check the compatibility and upgrade guides. We invite you to download it and to check the QuickStart guides, as well as to browse the documentation, which has also been properly updated. 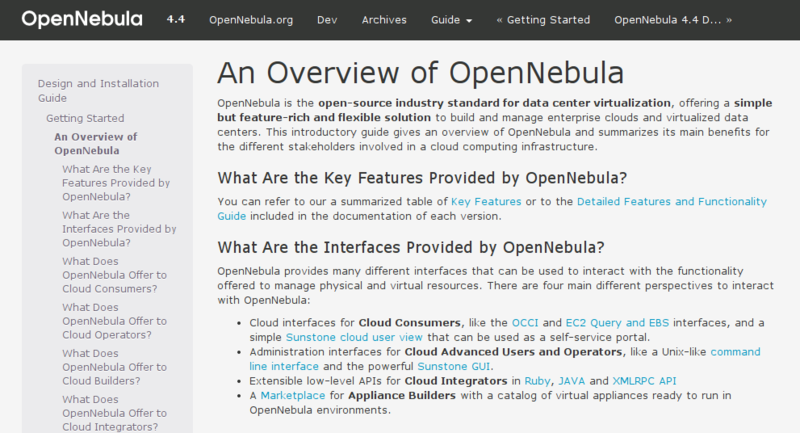 As usual OpenNebula releases are named after a Nebula. The Retina Nebula (IC 4406) is a planetary nebula near the western border of the constellation Lupus, the Wolf. It has dust clouds and has the shape of a torus. Thanks to all people and organizations that have contributed to OpenNebula 4.4! https://opennebula.org/wp-content/uploads/2018/11/opennebula_cloud_logo_white_bg-4.png 0 0 Tino Vazquez https://opennebula.org/wp-content/uploads/2018/11/opennebula_cloud_logo_white_bg-4.png Tino Vazquez2013-12-03 08:01:402013-12-03 08:01:40OpenNebula 4.4 Retina is Out!